For dinner tonight I made a spicy curried squash soup. 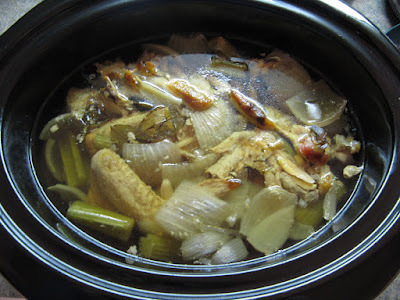 For the base of of my soup I made a crock pot chicken broth using last night's chicken carcass. 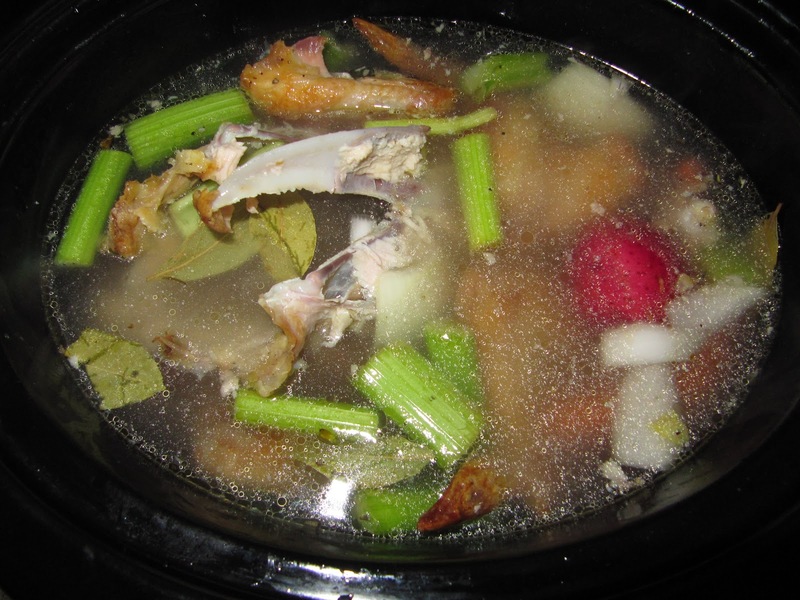 The idea behind using the crock pot is that I can cook the broth at a very low heat overnight, or about 8 hours. This allows for tons of flavor to be extracted from the chicken. I placed the chicken carcass in the crock pot along with a few chicken wings that I roasted in the oven, carrots, celery, onion and bay leaf. I added salt and pepper and cooked on low overnight. 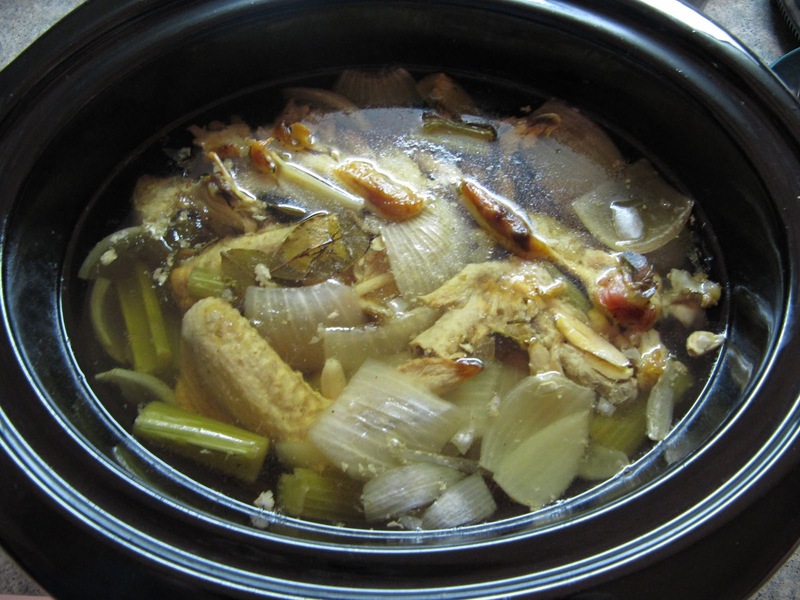 In the morning I woke up to the great aroma of chicken and vegetables. The broth was flavorful and the chicken had imparted all of its flavor. I strained the broth which I used to make my curried squash soup. 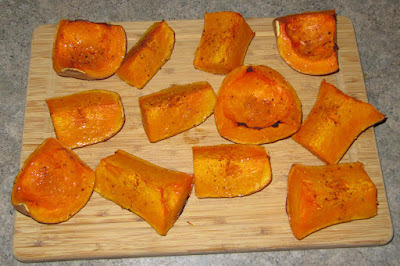 To begin I first cut a butternut squash in half and scooped out the seeds. 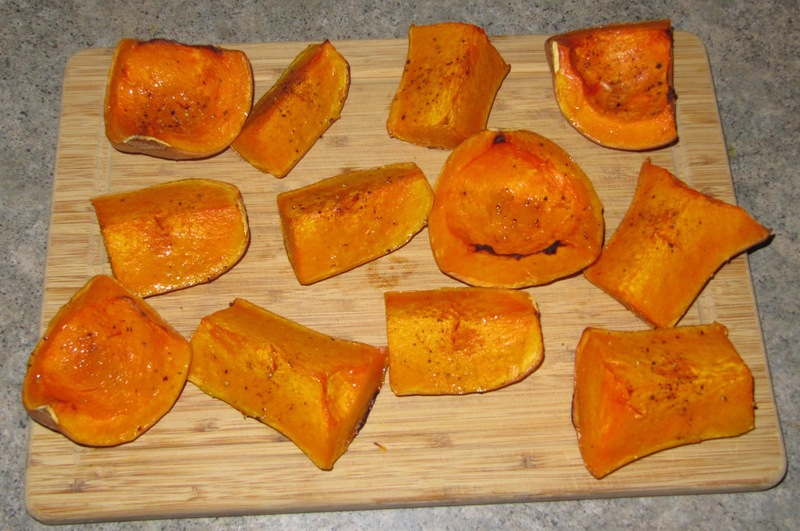 I cut the squash into large chunks, drizzled with a bit of oil, seasoned with salt and pepper and placed in a 375 degree oven for an hour, until the squash fell apart easily with a fork. 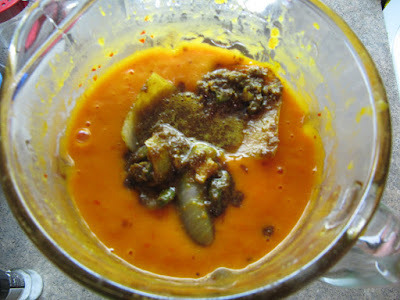 Using a spoon, I pulled the meat of the of the squash away from the skin and added to a blender. To this I added two guajillo chiles which I seeded and added to the blender along with a couple cups of chicken broth. 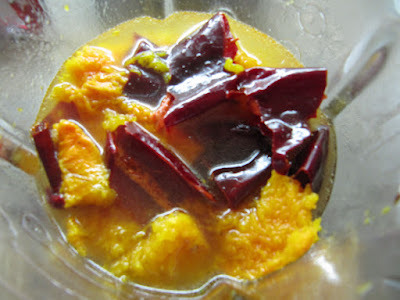 I blended this mixture until the squash was smooth and the guajillo was fully blended. I set this aside momentarily to focus on the spices for the soup. In a saucepan I sauteed onion, garlic, ginger and serrano chile then added 1 teaspoon each of tumeric, garam masala, ground cumin, ground coriander, cinnamon and brown sugar. I sauteed for another minute or so and added to the blender. After blending one last time I added a splash of heavy cream. 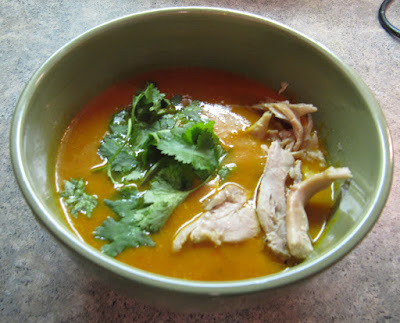 I served the soup in a bowl with a few pieces of last night's chicken and some cilantro. The soup was rich and had a good amount of heat to it. With the temperature getting so cold, this was the perfect way to warm up. Check out the recipe tab for this and other recipes.